In addition to protecting your online data, you’ll want to protect your physical devices too. Some of this is common sense, like making sure not to leave your laptop and phone unattended. It’s also a good idea to be careful when plugging USB devices into your computer, since they may contain malware that could damage your system or expose your personal information, so make sure to only plug in a USB device into your personal computer if you trust the person who gave it to you. 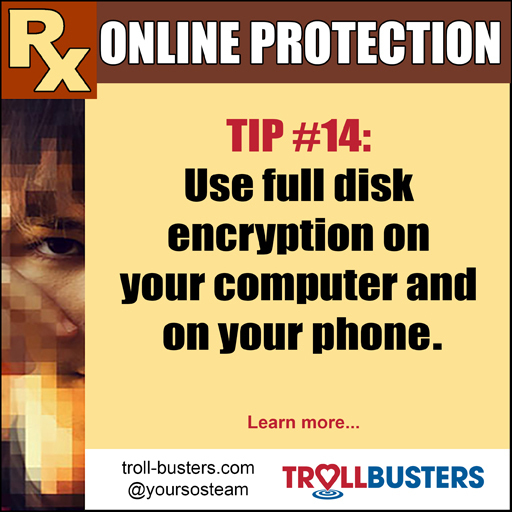 You’ll also want to make sure your computer has full disk encryption. That way, if someone steals your laptop and copies the files, they’ll just see a jumbled mess. If you’re on a Mac, go to System Preferences -> Security and Privacy and turn FileVault on. You’ll want to keep the backup key in a safe location. If you’re a Windows user, follow the instructions to turn on Bitlocker here: https://technet.microsoft.com/en-us/library/c61f2a12-8ae6-4957-b031-97b4d762cf31. Make sure to back up the data on your computer to an external hard drive kept in a separate, secure location so that you’ll have an extra copy of your data available in case of theft. You can set a calendar reminder to back up your data at regular intervals. You’ll want to encrypt your phone as well. Ars Technica’s encryption guide has step-by-step instructions for how to do that on an iPhone (which is decrypted by default, but the encryption isn’t automatically tied to a password only you know), as well as Android and Windows phones.